Hello again! Welcome to Epcot. If you haven’t read my highlights on Disney’s Hollywood Studios and Animal Kingdom, please do so now. Take in the beautiful scenery. Done? Okay, let’s ‘soar’ right in! Pick your mode of transportation! Soarin’ is a popular ride that allows you to hang-glide over California, feeling the wind in your face whilst smelling the fragrance of zesty orange trees. (Fun Fact: The first model for Soarin’ was made out of an erector set!) Once you land on solid ground, hop in a Chevy at Test Track. Strap yourself in and brace yourself for the ride of your life! Put on your space suit, join the NASA team and shoot for the stars as you travel to Mars in your rocket via Mission: Space. To ease back into Earth’s gravity, swim underwater to the ‘clamobile’ where The Seas with Nemo & Friends take you “under the sea.” Finally, use those feet and travel indoors to Innoventions where you’ll find interactive and educational games the whole family will enjoy. 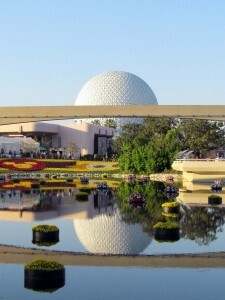 There are two entrances into Epcot. Walking in from the back entrance, you’ll step right into the World Showcase. Embrace the opportunity to visit eleven nations just steps away from each other. Each country is an immersive experience where you’ll find unique attractions, merchandise, cuisine and even Cast Members native to the land. Rock out to live entertainment such as Off Kilter and the British Revolution. Enjoy a relaxing stroll and admire the beautiful scenery (made increasingly more magnificent during the International Flower and Garden Festival). Bring the kids to a ‘Kidcot’ station where they can create their own free souvenirs at each nation. Take your time and have fun exploring the wonders the World Showcase holds. When I walk through the main entrance into Future World, there is a certain energy buzzing about. It’s a feeling of endless possibilities…of exciting things to come. 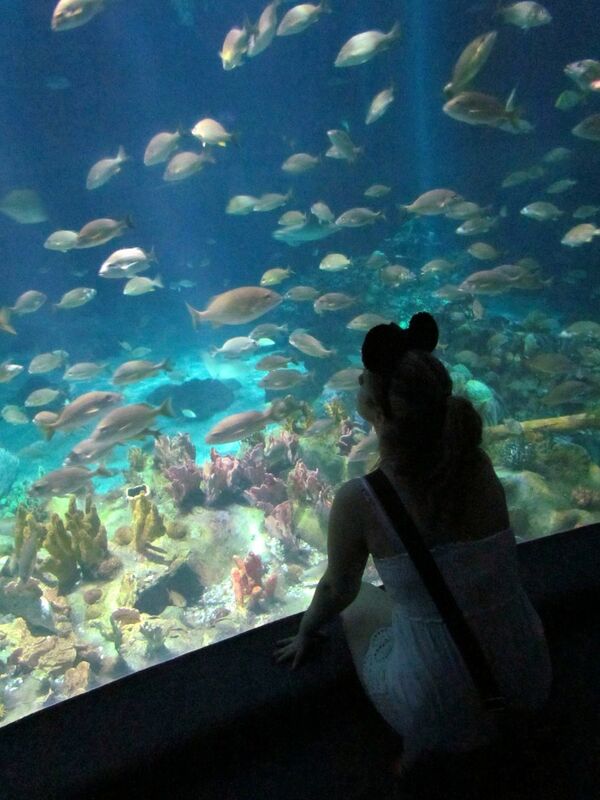 The Seas contains a nearly six million gallon aquarium full of thousands of sea creatures to observe. Living with the Land explores Disney’s agricultural breakthroughs and offers an additional Behind the Seeds tour that delves further into Disney’s fascinating horticultural techniques. Not to be overshadowed is the Fountain of Nations, an astounding fountain compromised of twenty-five different bodies of water representing twenty-nine nations. It serves as a reminder that no matter the distance, gender, race or views; we are one world. Good Grub indeed! When it comes to gourmet dining, Epcot hits it out of the park. Each country includes a different dining experience that carries you away to its native land. My personal favorite, Teppan Edo, found in Japan, is teppanyaki style dining that is not only delicious but entertaining as well. From juggling kitchen utensils to making an onion volcano, you won’t be able to keep your eyes off the chef! Akershus Royal Banquet Hall, found in Norway, is a great place to bring your little Prince or Princess (although who am I kidding? I went before I even had a child and was just as excited as the little ones dining around me.) As you consume a scrumptious feast, various Princesses come to your table, stopping for autographs and photo opportunities. Should you be looking to work off those desserts, dance to the polka after a buffet meal at the Biergarten in Germany. Try a pastry in France. Taste some Gelato in Italy. Gobble up fish and chips in the UK. Eeek! I could spend hours writing about the food but alas, I bet you’ve had your fill. For anyone who has seen IllumiNations: Reflections of Earth, you know that writing and reading about it just doesn’t do it justice. Located in the World Showcase lagoon, this fireworks show leaves you with goose bumps and (in my case) tears from the moment the torches surrounding the World Showcase are blown out. Meaningful music assists as fireworks, lasers and other pyrotechnics narrate the story of our earth’s creation. As the banging of drums signal the bursts of the first fireworks, you’re off on an adventure full of exhilaration, inspiration and hope. I have the soundtrack and highly suggest purchasing it if you can get your hands on it. A photo without people in it. Unheard of! What’s that golf ball doing here? Is Paul Bunyan playing a round of golf? (I know, these jokes have been heard over and over, but I couldn’t resist!) 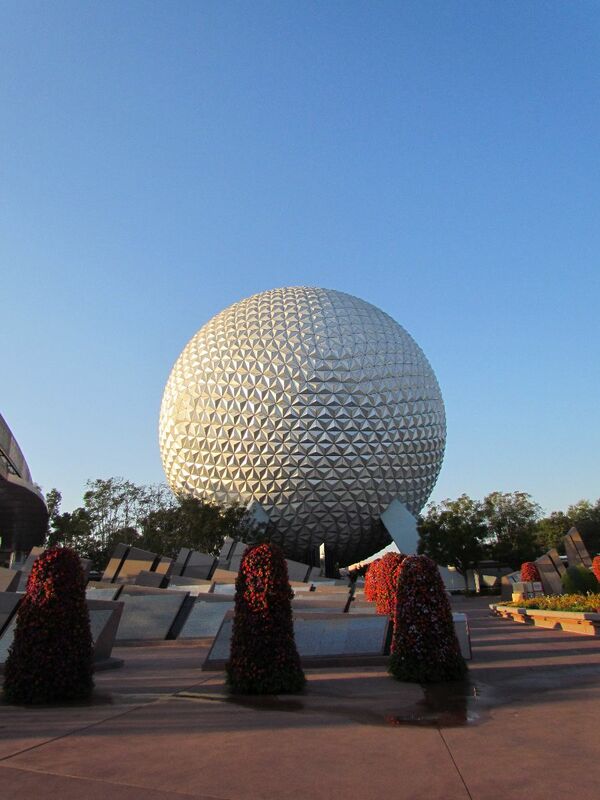 Spaceship Earth gives you an educational overview on how communication and technology have evolved from past to present. What I love about this ride is how I can sit in a cool, slow-moving vehicle while going back in time. Not only are there realistic animatronics telling the story but you can participate in Project Tomorrow, an interactive experience that presents state-of-the-art advances in medicine, transportation and energy. Should you have the chance, I highly recommend taking advantage of the tours Epcot has to offer. My husband participated in DiveQuest where he was given a tour of the aquarium before plunging into the waters; snorkeling and scubadiving amongst sharks, barricudas, sea turtles and more. A couple of years ago, we went on a Segway tour of the World Showcase and it was incredible! After a crash course (literally…I ran into a wall), we embarked on a private tour before its 11:00 AM opening led by a guide who shared facts and stories about each country. Once I got the hang of it, I was weaving in and out around pillars and maneuvering my way through the shops without breaking anything! Unfortunately, the Segway tours at Epcot have been cancelled. I think we should start a petition to bring it back. It was such an awesome experience that I would definitely do again. Epcot is without a doubt my favourite park. If I have my way I’ll easily spend half my trip wandering around and enjoying everything. It helps that I’ve been to all of the countries present in World Showcase except Morocco, so it’s easy to chat with the friendly cast members about their native lands. Mix in the fact that most of my must-do attractions are located here and (for me at least) we’ve got a winner. Most importantly for me, Epcot and the seas attraction is what set me on the Scuba diving path. On my honeymoon trip, I saw the divers in the tank and thought that would be great to try, I returned home and picked up a certification. Ten years later and I now carry an instructor card, sometimes Disney really can impact your home life. Dive quest is certainly worth at least one go if you have a C-card, half the fun is swimming by the windows in the Coral Reef restaurant and seeing the kids get all excited that you wave back to them. Just be warned, the aquarium lighting and windows do hide a lot of the issues they may be having at the time in the tank. On my last dip many of the fish had large lesions, scale issues and some of the grunts had blisters the size of golf balls on them. I didn’t notice it outside the water and couldn’t really tell once I was back on the outside, so be prepared for that. Just walking around the World Showcase is, without a doubt, one of my favorite things to do in all of WDW. It’s the reason I love to stay at the Boardwalk. It’s just a quick boat ride or walk away! How cool that the Seas turned you on to scuba diving. The same thing happened to my father-in-law and he is now certified as well. Funny how those ‘Disney moments’ can change your life. Technically, Teppan Edo is a teppanyaki restaurant, not hibachi. But regardless, it’s yummy and fun! I’ll correct that error right now!